“It is a real travesty,” he said pointing out that the railway passed within 150yd of the airport terminal. He noted that 50% of passengers currently use the DLR and that the 2018 figure of 4.8m people passing through is likely to be beaten in 2019, with something in the order of 6m-plus predicted for the early 2020s when the entirely-rebuilt £500m terminal is completed. Answering a runway question, he said the new parallel taxiway would smooth out operations and. more importantly, increase movements. 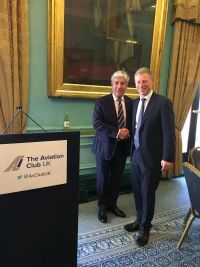 Regarding airspace, Sinclair promised to ensure any overload at zones where air traffic from LCY and LHR conflicted would be given a careful look and assessed, pointing out the new aircraft were even quieter than the ones they replaced. Sinclair noted London City is an airport for all – “50% of our traffic is now recreational”. He was damning of what he called “the double whammy of airport departure tax”, 26% of traffic is domestic, the highest of any major airport in the UK.